In 1903, aged 23, Mary Macarthur arrived in London as Secretary of the Women’s Trade Union League. 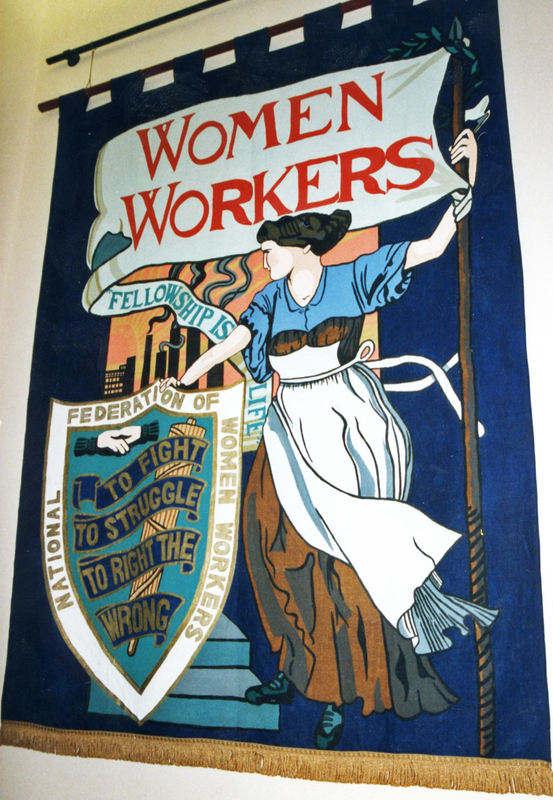 In 1906 she established the National Federation of Women Workers to organise women against the sweated industries and in their fight for the working wage. 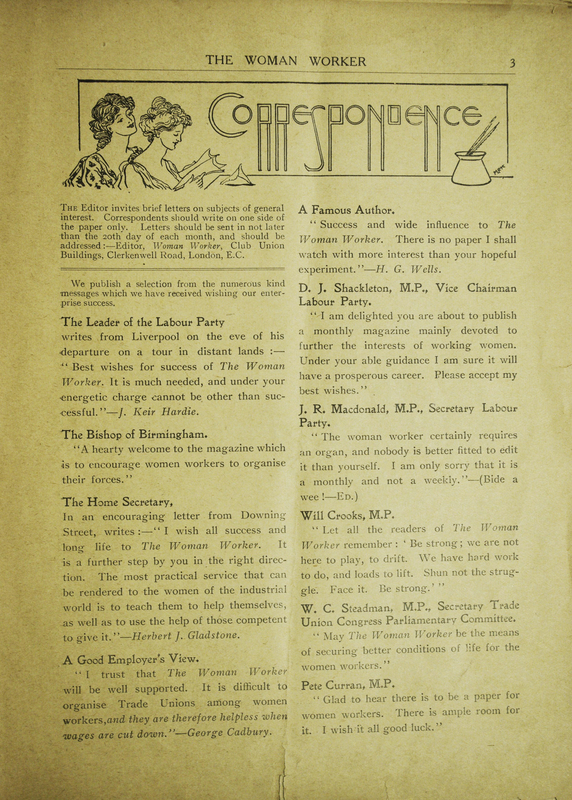 Between its establishment and its 1921 combination with the National Union of General Workers the NFWW made many advances for women working in industries, for example playing a “major part in inducing the Liberal government to pass the 1909 Trade Boards Act” (Mary Davis, Manchester Metropolitan University). 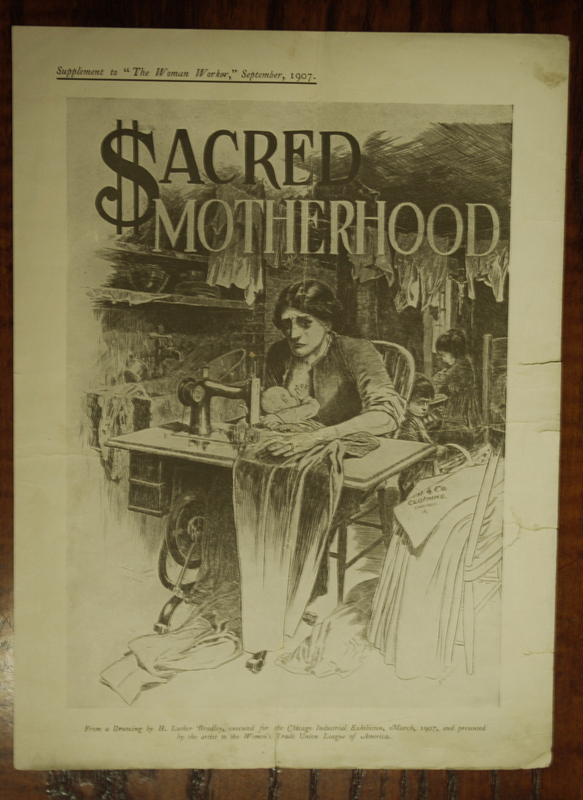 First published in 1906 by the NFWW, The Woman Worker sought to further the work of the Federation through a combination of anecdotes, informative articles, allegories and relevant advertisements. Effort to embed and teach a sense of unity flows through the paper and is particularly clear in ‘Messages from Prominent People’ which features messages of support from Keir Hardie and the then Home Secretary, amongst others. ‘Overheard by the little bird’ further helped embed this unity, with snippets of positive conversation about the movement; in Taunton for example it was overheard ‘that soon the unfair deductions for cotton will be a thing of the past’. Though this is not prominent in the first publication, it is outlined that in future readers can expect to find practical advice such as articles explaining the scope and purpose of laws relevant to working women. There was also a real sense of the need to deal with “…the pathos and tragedy of the life of the sweated home worker…” (Mary Macarthur, editorial note, The Woman Worker Vol 1 No 1). These women’s jobs were the most unregulated and others were encouraged to take responsibility for the betterment of these sweated conditions. The Woman Worker was not wholly concerned with matters of work and unionism though. 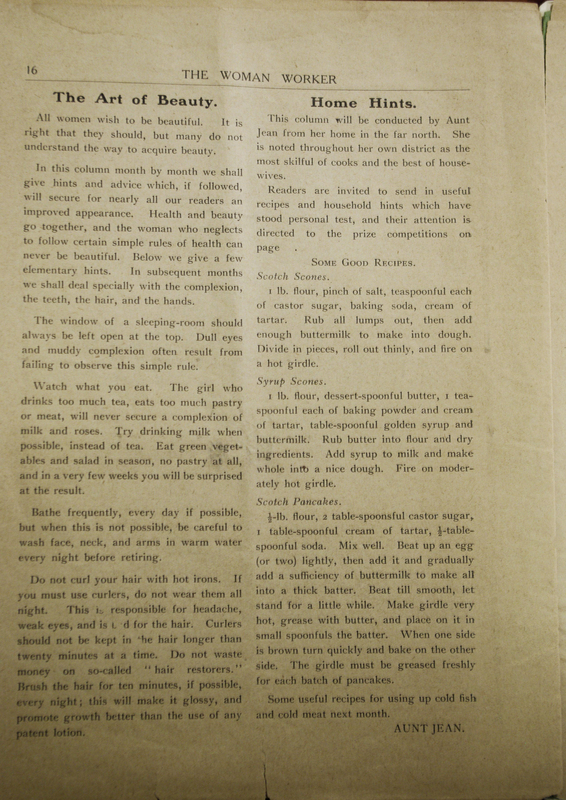 Popular features ‘The Art of Beauty’ and ‘Home Hints’ were penned to appeal to the lighter interests of readers and offered titbits of wisdom such as “The girl who drinks too much tea, eats too much pastry or meat, will never secure a complexion of milk and roses” (The Art of Beauty, The Woman Worker Vol 1 No 1). 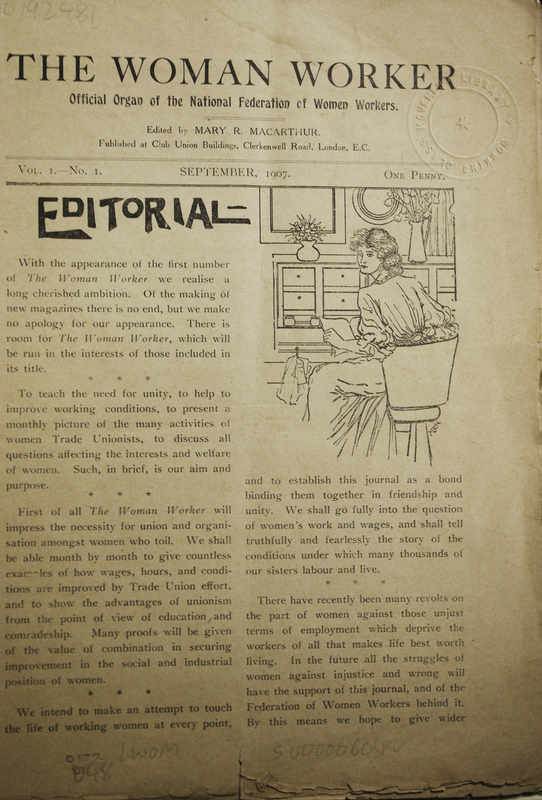 “We intend to make an attempt to touch the life of working women at every point, and to establish this journal as a bond binding them together in friendship and unity”. And its readers must have felt an affiliation with the paper, for it later went from being a monthly to a weekly newspaper. This entry was posted in Uncategorized and tagged Mary Macarthur, National Federation of Women Workers, Sweated labour, The Woman Worker. Bookmark the permalink.